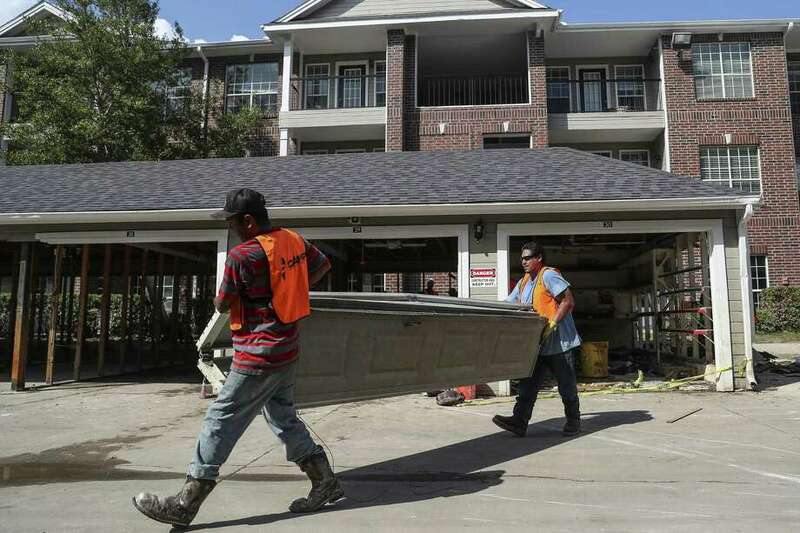 Construction work is carried out at a Houston apartment complex after Hurricane Harvey. Construction jobs rose by 4,500 in Texas during October. Texas hiring rebounded significantly in October from a Hurricane Harvey-induced employment drop in September as state unemployment reached a record low, the Federal Reserve Bank of Dallas reported Friday. Texas added a whopping 63,400 jobs in October, largely due to a 22,900 job gain in the Houston area and continued strong employment growth along the Interstate 35 corridor from San Antonio to Dallas/Fort Worth. The Texas unemployment rate dipped to 3.9 percent, a record low. The state’s unemployment rate had never been below 4 percent since the start of the Federal Reserve’s statewide records in January 1976. The San Antonio area, meanwhile, continued its pattern of slightly faster hiring by adding 3,000 jobs in October, staying on track for 3 percent job growth for 2017, compared to the state’s forecast of 2.6 growth this year. Texas jobs grew only 1.2 percent in 2016, but so far this year has seen jobs grow at a 2.7 percent rate. The strong job market has made hiring a challenge for San Antonio area employers. “Finding qualified talent remains our biggest challenge. All of the skilled people are in high demand,” said Kandace Hawkins, CEO and president of staffing agency Tri-Starr Personnel in San Antonio. “We are having to go to other cities in Texas and outside of Texas to find qualified people in information technology, especially in the software development space,” Hawkins said. Tri-Starr Personnel concentrates in the information technology and technology fields, along with helping staff call centers, Hawkins said. They seek personnel for contract work, usually tied to employer projects, and temporary-to-hire services. “The customer service business is growing quite well,” Hawkins said. “We are having a difficult time finding qualified people to hire” for accounting positions, she added. Plenty of people are seeking jobs and submitting applications. “We have plenty of people on the job boards, but we have to cull through them to find what our clients are looking for,” Hawkins said. “We will face this imbalance until we close the skills gap with more education,” she said. The Dallas Fed revised its report of 4,400 jobs losses in Texas during September, now saying only 1,400 jobs were lost that month after Hurricane Harvey hit Texas on Aug. 25, flooding the coastal area. “Texas is back on path. The Gulf Coast is rebounding, too,” said Dallas Fed Senior Economist Keith Phillips in San Antonio. Despite all of Hurricane Harvey’s disruption and destruction, “the story remains the same for Texas,” with the state resuming its 2017 job growth forecast. “There was a loss of wealth in the flooding among homeowners, but in terms of job growth, the state has now bounced back as expected,” Phillips said. The construction and leisure-and-hospitality sector accounted for the most growth in hiring in October after visitors steered clear of Houston in September. Some repair workers in October in Houston stayed in hotels and dined out more than usual, Phillips pointed out. Houston added 10,600 construction jobs in October after losing 8,400 in September, according to Dallas Fed data. Texas’ largest cities all saw drops in their unemployment rates during October. San Antonio’s jobless rate fell from 3.9 percent in September to 3.6 percent in October, the lowest rate for the San Antonio area since 3.4 percent in December. Austin’s unemployment rate was 2.6 percent, Dallas was 3.2 percent, Fort Worth was 3.8 percent and Houston was 4.5 percent. “It validates what we’ve been hearing from Texas employers in the last year, that it is more difficult to find workers. I believe (the low unemployment rates) will constrain job growth in the future. But Texas attracts workers into the state from net migration, and the state will continue to see job growth,” Phillips said. Like Houston, San Antonio had a construction-job surge in October, adding 1,700 positions. “Construction has been growing well in San Antonio all year, but the increase in October could be crews of San Antonio construction companies rebuilding on the Gulf Coast,” Phillips said. The leisure-and-hospitality sector grew by 4,200 positions in October in San Antonio, while education and health care added 400 jobs. Phillips said the health care and government hiring sectors have been the strongest sectors year to date in San Antonio. Retail has been among the weakest, especially earlier in 2017 when the Mexican peso had its lowest purchasing power. In San Antonio, the retail sector added only 60 jobs, but the total number of retail jobs year to date is down 2.2 percent. “Retail also is weak statewide and nationally. The big-box retailers are adjusting to online shopping,” Phillips said. Staffing firm Robert Half is seeing the pace of hiring pick up in certain industries. “It’s been a great year. New roles are emerging all the time,” said Scott Steele, Robert Half vice president and San Antonio branch manager. In the accounting and finance sectors, demand is high for staff and senior accountants, financial and business analysts and internal auditors, Steele said. “We’re looking for well-rounded skills in those areas. There’s also an uptick at legal firms for paralegals, especially with three years of experience, in litigation, commercial law and real estate law,” Steele said.